If you are the adventurous type then you will be thrilled at the amazing adventures near us including white water rafting, horseback riding, quad tours, dolphin and whale watching, snorkeling and scuba diving, sleeping in a cave behind Diamante Falls, Costa Rica's tallest waterfall, parasailing, paragliding, rappelling down waterfalls, stand up paddling, surfing, Alturas Wildlife Animal Sanctuary, tours to local organic farms and to meet local artisans, and zip lining and canopy tours over forest canopy , canyons, creeks with panoramic views of jungle and ocean. We strongly suggest a visit to Corcovado National Park (two hours south), where you will find diversity unsurpassed by any region of similar size anywhere on earth. Also visit Manuel Antonio National Park (about one hour away), one of the most famous tourist areas in Costa Rica offering championship surf tournaments, hiking, rafting/kayaking, canopying, sports fishing and more. Contact us to let us help make your vacation an amazing adventure. 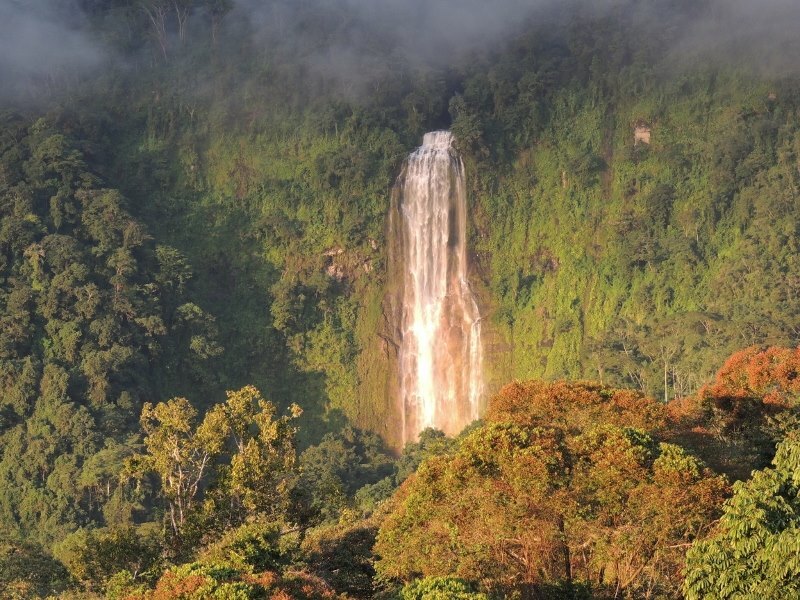 Costa Rica has plenty of stunning waterfalls but probably the most spectacular are the Nauyaca. 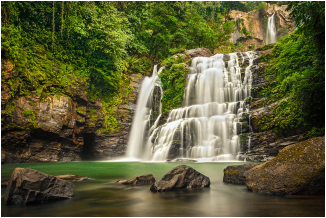 Set in the tropical rainforest, with two sets of falls measuring a combined 61 meters (200 feet) tall and a large natural pool for swimming, Nauyaca is the ideal place, not only for those in search of tranquility and nature, but also for adventure and excitement lovers. Costa Rica surf is some of the best in the world. Join us in heart of the Costa Rican rainforest along the shores of Costa Rica’s Pacific Coast in Dominical – where the mountains meet the sea. Whether it’s the first time you’re dipping your big toe in the ocean or you’ve been surfing for years, you will walk away an improved and more complete surfer. In the jungle, proceed down river (which is adventure in itself), shooting through natural water chutes, past boulders as big as houses, through untouched Jurassic Park like areas very few people will ever see. 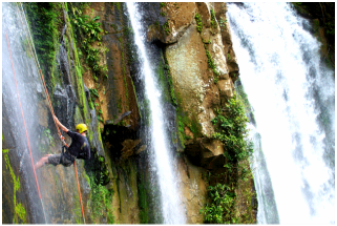 Then rappel alongside spectacular waterfalls for some of the most exciting descents in the country, floating through pristine jungle pools and steep canyons along the way. An unparalleled experience. Paragliding is your ticket to the heavens. 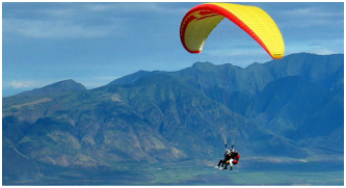 Soar over the jungle overlooking thousands of miles of ocean over one of the most beautiful paragliding sites in Costa Rica. The best way to see the beauty of the region. Trek 1.5-2 hours up winding trails amongst the pristine cloud forest and rainforest overlooking spectacular pacific coastal views to this incredible jewel of the jungle, “Diamante Verde” (Green Diamond), where surrounded by 1,200 feet of cascading waterfalls, you will find the “Casa de Piedra” (House of Stone) or as the locals call it "The Cave". Once inhabited by indigenous people, this amazing open air cavern is set behind twin 85-foot waterfalls and features a full size kitchen and comfortable sleeping quarters. 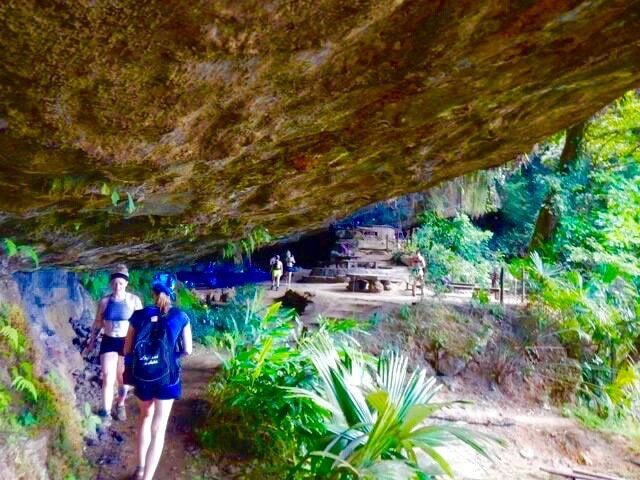 Activities while at the cave include hiking to crystal swimming pools, cliff jumping, and exploring nearby trails! Invigorate your sense of adventure. This is a nature tour with some of our favorite guides who are experts at the local plants, medicinal, culinary and poisonous. Massage style: Hybrid of Polarity Therapy and Trigger Point Release massage with elements of Thai massage and Lomi Lomi. Being a body worker for 15 years, Christopher Gardner, has touched well over 1000 clients in eight different countries. Balancing the nervous system and releasing trauma from muscle fascia is his primary focus using primarily a combination of Polarity Therapy and Trigger Point Release. Massage style: Deep Tissue meets Thai Massage : Full body strong pressured massage to release tension and tightness followed up with assisted yoga stretching. The massage is different each time in the strength of pressure and sequencing depending on the body. Each session pushes you to your edge leaving you feeling more open, free, and relaxed. Amber's passion to connect with others through healing led her to learn a variety of bodywork approaches. She studied Western Massage Therapy in Fort Collins, CO. Shortly after moving to Dominical, Costa Rica. Amber's love for the benefits of yoga and bodywork inspired her to become certified in Asian modalities such as Thai Massage and Shiatsu ( Japanese Massage ) Today, she weaves her knowledge of the body and the principles of yoga into each session while offering a variety of bodywork techniques.